Willie Warren has fought some valiant fights in his lengthy career. But not against Curtis Parker. 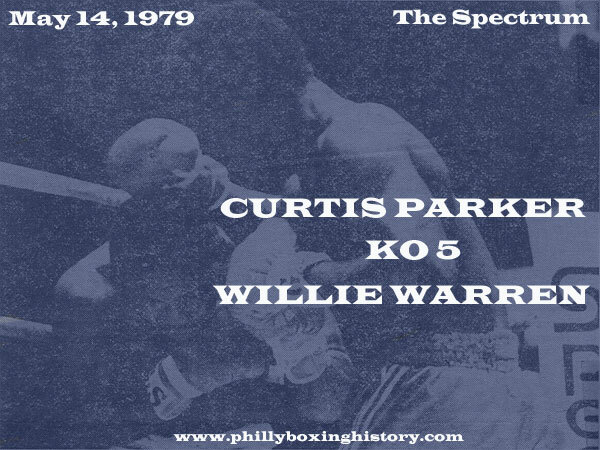 Parker, the pride of Frankford, knocked poor Willie all over the ring last night in the "main event" at the Spectrum, finally scoring a TKO 2:37 into the fifth round. By the fourth round the sparse Spectrum crowd of 3,464 was imploring referee Tom Reid to "stop the thing." Yes, it was that pathetic. A superbly conditioned 20-year-old Parker had Warren rubber-kneed in the second round. By the third round Warren's eyes were rolling around in their sockets like cue balls on the loose. His face was puffing and the only reason the worn out 32-year old Veteran landed a couple of punches was because they hit Parker's body by accident. In the fifth round Parker finally pinned Warren so mercilessly into the corner with a salvo of blows to the head that even the ref saw it was time to stop the bout. Three days ago Parker had said that stopping Warren, who had never been stopped before, would be "the ultimate" of his young career. He didn't act like a man who'd just climbed another mountain last night after the one-sided bout. "I felt as though he was a stepping stone and that I did good in the fight," Parker said. "I'm not the person that would go crazy over winning a fight. I humble myself decently to where I say "Well, I won that. I'm moving towards my goal of becoming middleweight champion of the world. Say this was the middleweight title fight, I'd act the same now. You know, the Lord has blessed me. So why should I go hysterical over beating Willie Warren." What a sad thing that those old veterans just can't hang up the gloves. Warren, out of Corpus Christi, grabbed the mike and said 'How about a rematch?' on his way out of the ring. And then he babbled on about how "The kid is going to be good." What a joke. The fans who plunked down the big dollars deserved a better main event. Parker almost looked hesitant in his punches as Warren started to stumble aimlessly around the ring. "Not really," Parker insisted. "I was looking forward to get rid of him in the early rounds. I heard he had a good overhand right and I didn't know if he was waiting to come back in with it. I was ready to go the distance." But whatever Willie once had had gone by the way of that black hair that is now turning grey and the body that is falling apart. "Boxing is more like a hobby and a talent I utilize to the best of my ability not knowing how long this can really go on. As long as I'm in good physical condition, I don't really see anything wrong with me constantly fighting." And chances are, Parker will never become a Willie Warren and turn into just a shadow of his former self some far off day. This article ran in the Philadelphia Journal on May 15, 1979, the day after the Parker-Warren fight.